Song Yu was a well-known poet in the state of Chu during the third century BCE. He is commonly said to have been a disciple and/or nephew of Qu Yuan, but no reliable biographical information is available. Jiu Bian literally means Nine Arguments; also possible is Nine Apologies or Nine Changes (David Hawkes). The original edition of Chu Ci does not give the divisions, and modern editors have variously interpreted it as having nine, ten or eleven. Those used here follow David Hawkes (see Songs of the South, Penguin edition, pp.207-219). Jiu Bian begins: "Alas for the autumn air! Bleak and cold; plants shake and lose their leaves and petals, falling into decay." From this and other contents of the poem it is clear that the poem and the qin melody Song Yu Bei Qiu have the same theme. The qin melody Song Yu Bei Qiu in Xilutang Qintong (1525 CE) has eight sections and a harmonic coda. As with Zepan Yin and Li Sao, it uses qiliang tuning (2 4 5 6 1 2 3.) There is no modal preface. As is explained in Sources of the online Chu Ci Illustrations, the illustrations by Bai Yunli are based on earlier ones by Men Yingzhao. 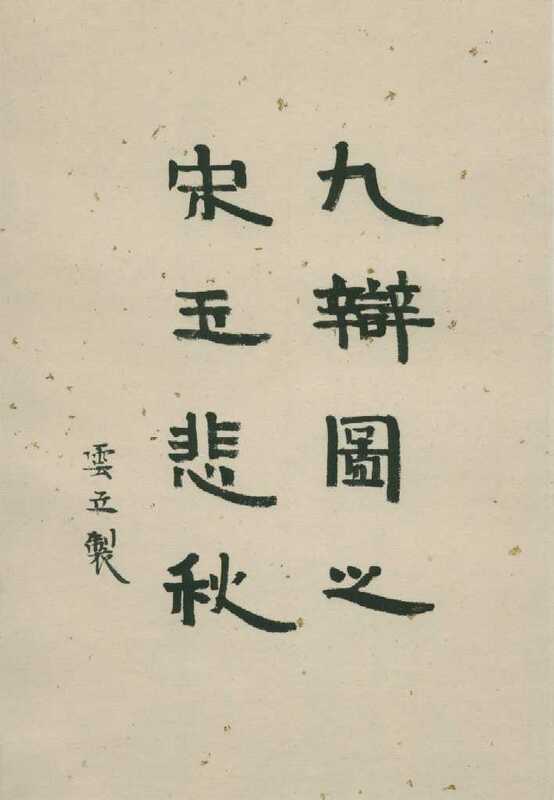 The original titles have been adopted as titles for the eight sections of Song Yu Bei Qiu, with the ninth illustration used for the closing harmonics. Commentary is added here to connect the developing theme of the 11 poems.